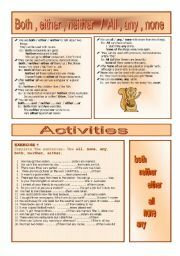 A nice and and very useful WS to learn the differences in use between MAKE and DO. 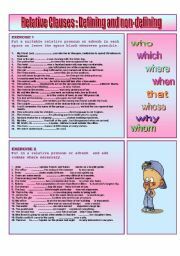 .There is a lit with the most important expresions used with each verb. 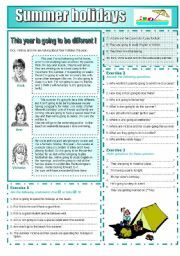 2 exersices to practise both verbs in diffferent tenses. KEY is included. I hope you like it. 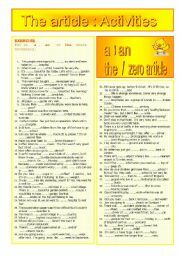 Fill in exercise to revise the use of the article in English. Key included. 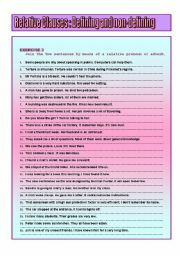 A worksheet to work with relative pronouns and adverbs. I hope you like it. 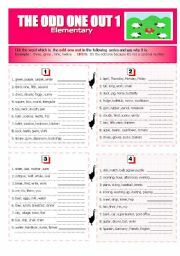 To practise these words three exercises with key included. I hope you like it. A new Wh about this series READING AND GRAMMAR . 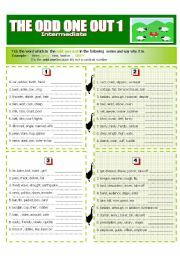 This time you�ll work with FUTURE TENSES ( BE going to, Will and Present Continuous). 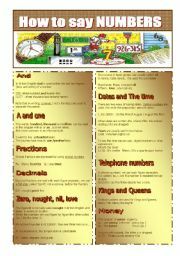 The text is related to the grammar point, and it includes seven exercises ( true/false, answer the questions, make questions and future tenses exercises) I hope you finf this series very useful. This time for intermediate students. 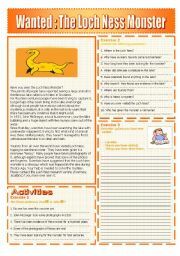 They �ll be able to revise a lot of vocabulary from different topics. KEY is included. I hope you�ll find it useful too.